While 3D printing has been around for many years, the machines have typically been worth many 10s, even 100s of thousands of dollars. This is now rapidly changing, with the maker movement starting and encouraging a trend towards sub $1000 3D printers, putting it well within the reaches of the average person, where the same machine just five years ago would have cost in excess of $20,000. Once a concept reserved for the pages of science fiction, can now be found sitting in the living room. I estimate that within 10 years, a high proportion of homes will have some form of 3D printing device, and it will be in common use in stores like Harvey Norman and Ikea (in the way that the photo print booths are now). When you require a spare part, it is just as likely to be printed on demand as held in stock, or available as a file to download and print at home. By and large, the sub $1000 printers that are now available are still relatively utilitarian, a mass of cables and components, retained within a basic shell, and often not even that. That matters little to those using these devices – window dressing is not a high priority when compared to functionality. There are moves by some of the big companies, such as HP, and some speculation they will be joined by Apple and Google in releasing consumer-level printers, although it will be a while before they become particularly affordable. 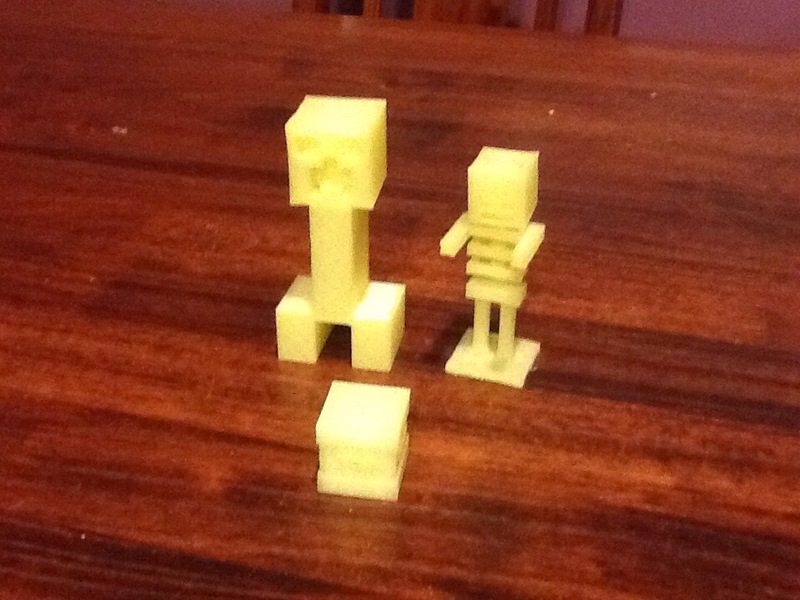 There are three main forms of 3D printer. The most traditional form, with linear (Cartesian) movements in the X, Y and Z directions. It may be that the print head makes these movements, or it can be stationery in one or more of those degrees of movement, and instead the object itself (or rather the supporting bed) makes the corresponding movement. The printer I have for example, has the print head moving in the X and Z directions, and the printer bed moves in the Y direction. A very uncommon form (in fact, I have only seen a single example of such a printer), with the print heads (and base) using polar coordinates to reference printing points. 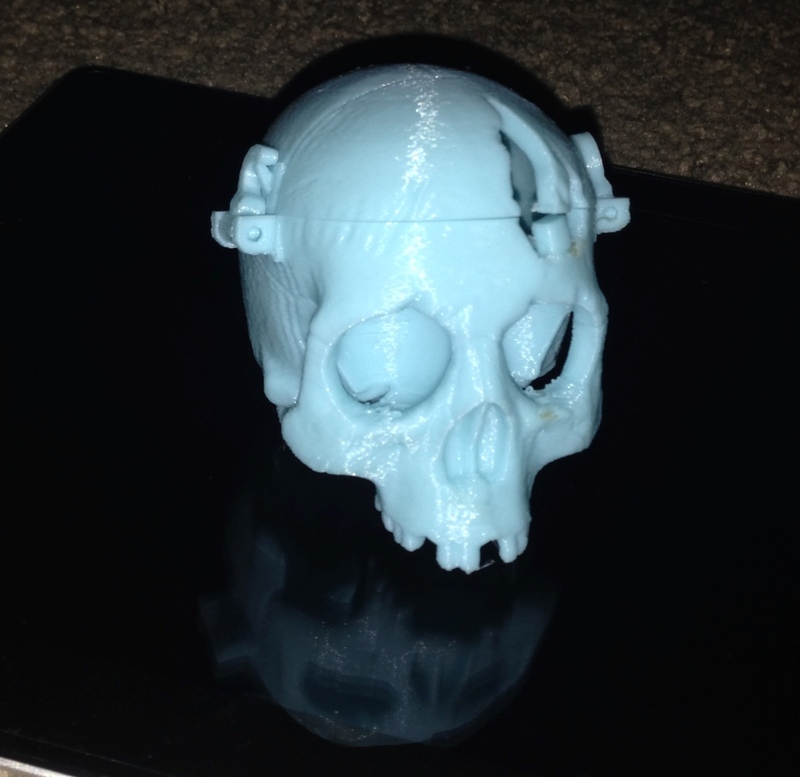 This is becoming a popular orientation, with three print arms each rising and falling on the Z axis, causing the head to be pulled one way or another, covering the base area. The orthogonal / delta discussion is very likely to retain supporters on both sides. It won’t ever reach the levels of PC vs Mac, but there will be evangelists for each concept. 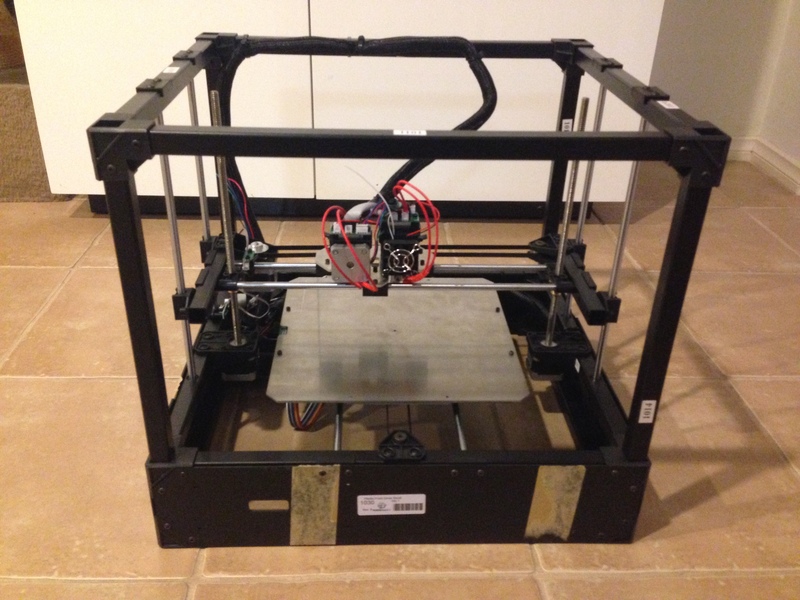 There are a number of common components to 3D printers, starting with the printer head. While the consumables will be covered in greater detail in step two, the solid plastic tube (called the filament) feeds into the print head. On a direct printer setup, the motor and associated gearing that grips the filament is situated on the print head, and it pulls the filament from the storage reel and pushes it into the hot end. 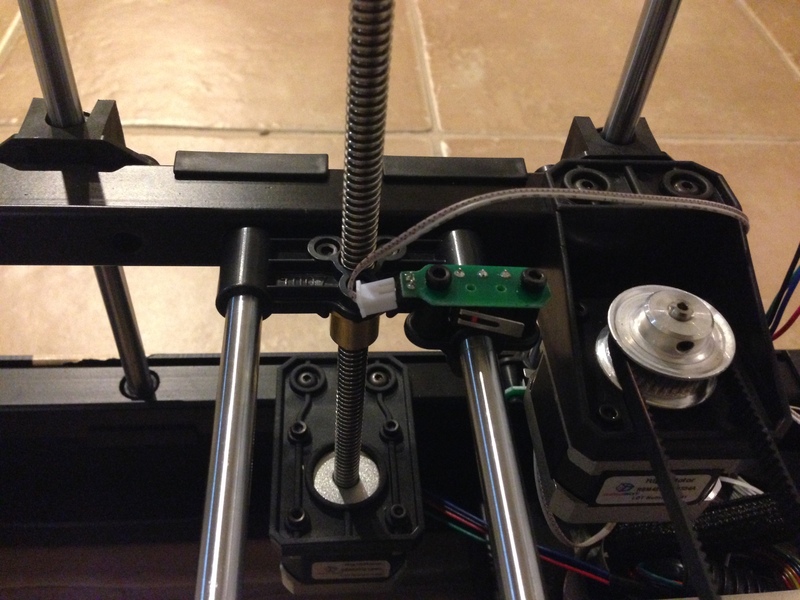 The combination of stepper motor and gear used to push (and pull) the filament is called the extruder. 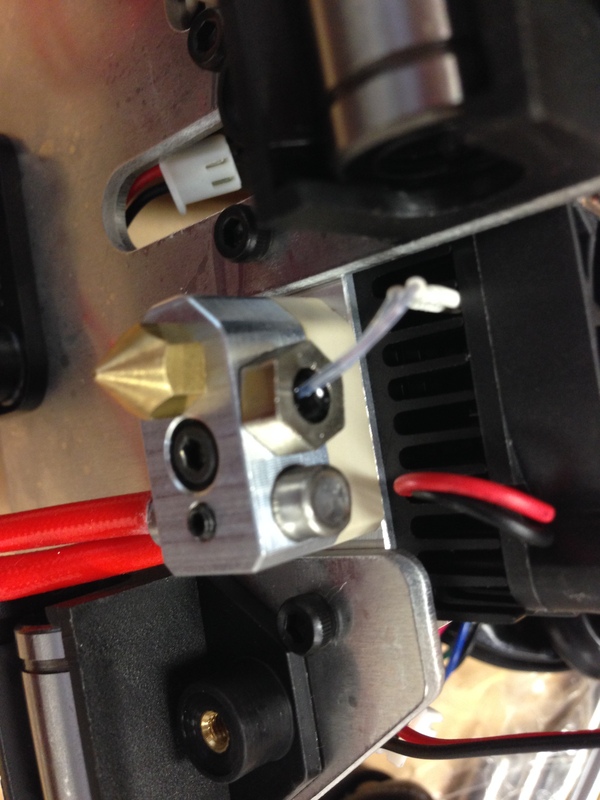 There is another setup where the extruder is located away from the print head in a stationery location. It pulls the filament from the reel, and feeds it through a PTFE tube (Teflon) to the print head. This is called a Bowden feed, and has the advantage that the printer is not having to deal with the added weight of the extruder on the moving print head. The hot end is where the magic happens. Such a simple concept, you really have to wonder why it took so long for it to come to fruition. The filament feeds from the extruder down a short length of PTFE tube which is in a cold section – this is either air or water cooled so the filament inside does not begin to heat too early and cause a blockage. It then passes into a hot block where the temperature quickly transitions up to and beyond the melting point of the filament. Cold filament pushing from above forces the molten filament to continue down and out of the nozzle. 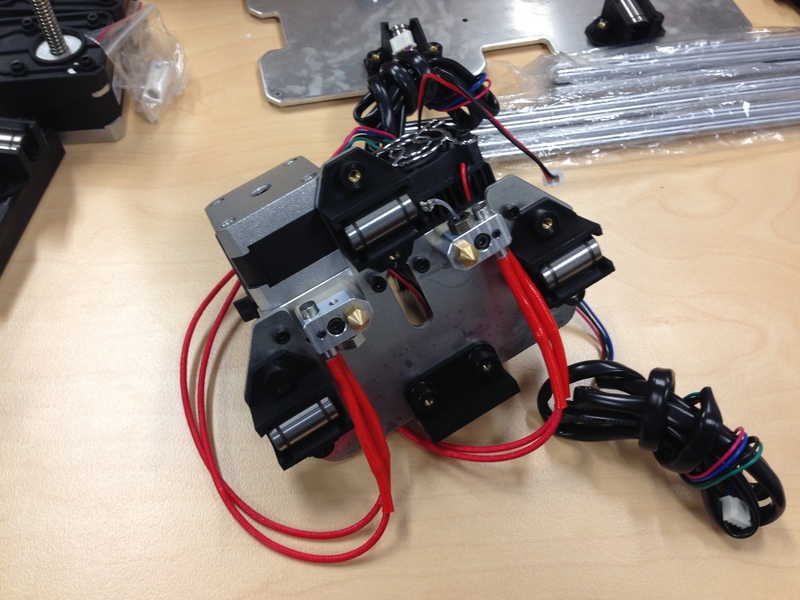 Starting and stopping printing is achieved rapidly by the extruder motor being run forward and reverse as required. 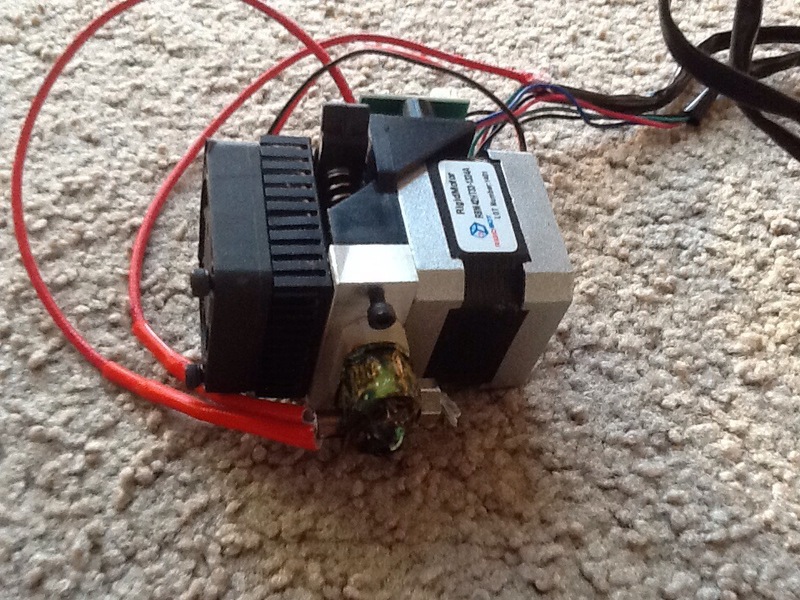 Being a stepper motor, its rotational position is accurately controlled. The nozzle has a diameter typically between 0.2mm and 0.8mm, with 0.4mm being a very common size. A larger nozzle can extrude filament faster, but with a rougher (textured) finish. A fine nozzle produces a smoother, more accurately dimensioned object, but with dramatically increased printing times. 0.4mm appears to be a reasonable compromise between these extremes. 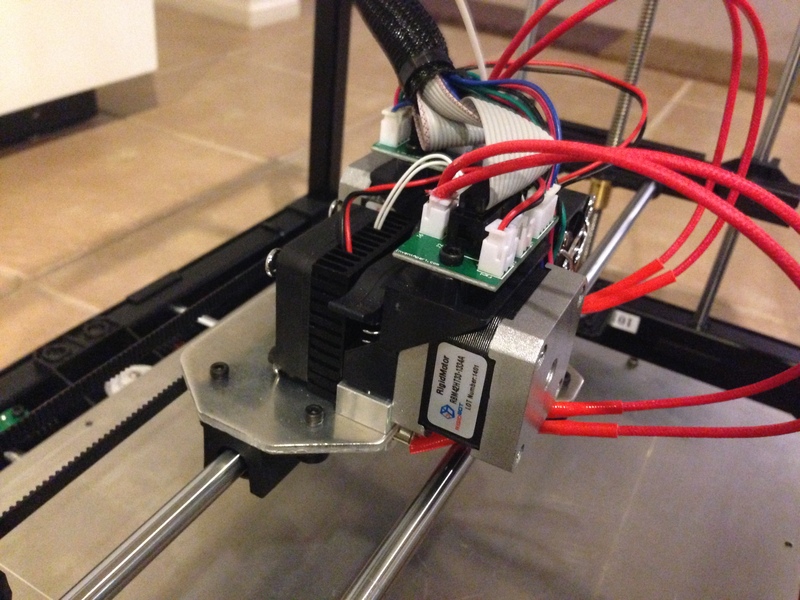 The hot block has a heating element (controlled by the printer), and a thermistor to provide the printer feedback on the temperature of the hot end. 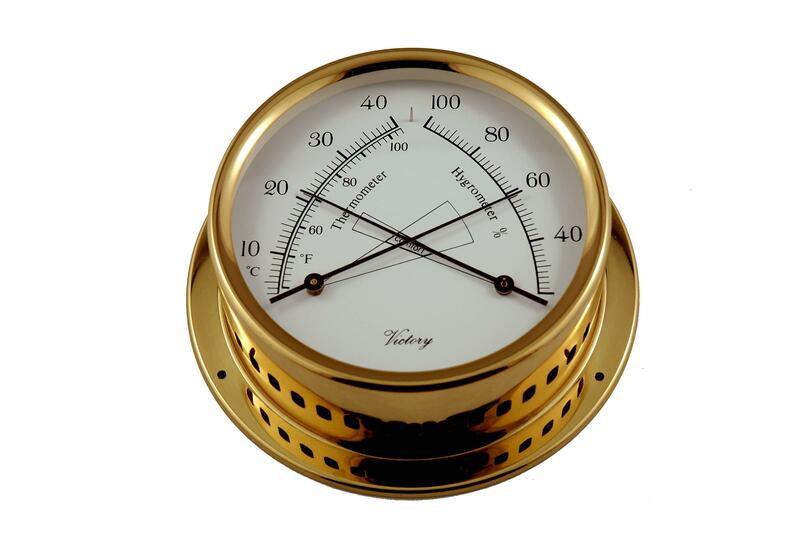 Temperatures up to 300C can be achieved on some printers. 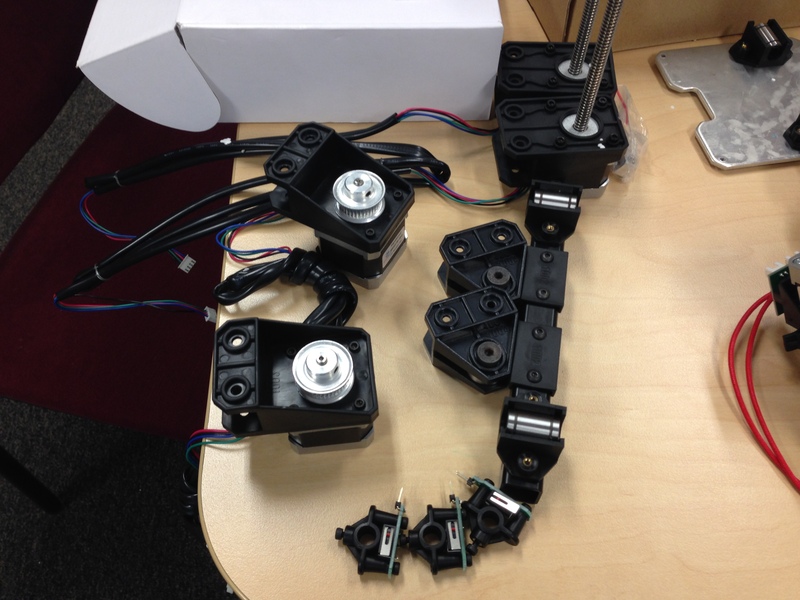 The other stepper motors that make up the printer control the position of the print head relative to the part being made. 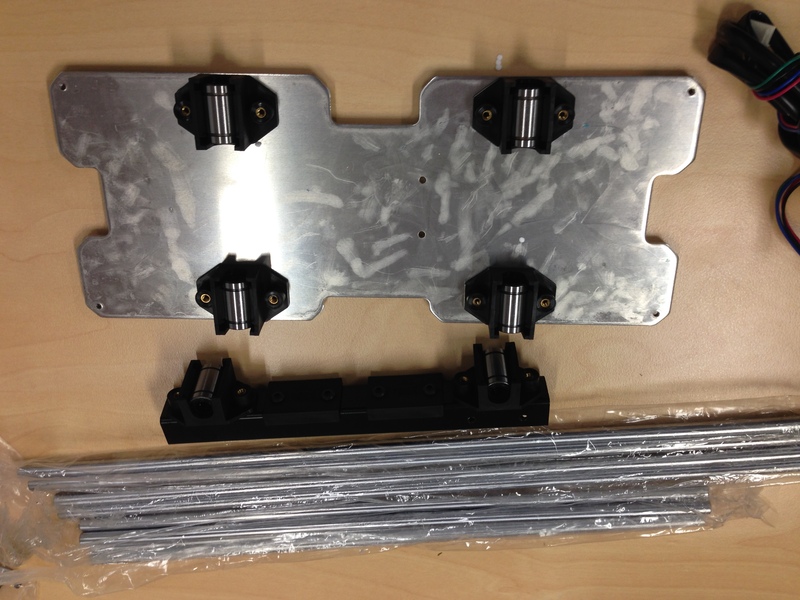 For the X and Y directions, the stepper motors turn a pulley attached to notched drive belts. The Z direction is a threaded rod, and the whole gantry slowly moves up as each layer is printed. The item being made is deposited on the printer bed. Ideally, this can be heated, especially if printing ABS and other plastics that tend to warp if cooled unevenly. The heated bed should be able to achieve around 100-110C. 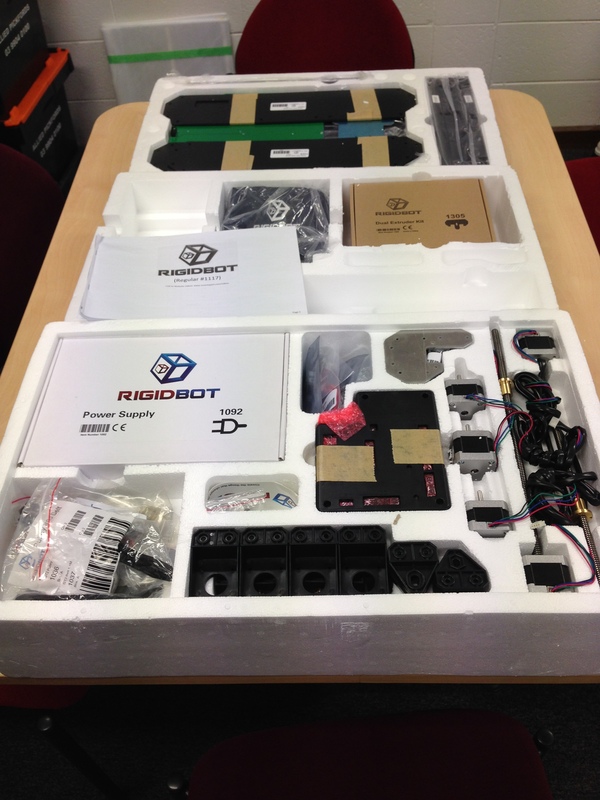 Every component on the printer plugs into a controller, which is commonly arduino-based. It in turn is fed the “G Code” either directly from the computer via USB, or from an SD card. The G Code is created by the slicing program, discussed further at step 4. The ‘ink’ used in these printers is just a little different from your standard computer printer. 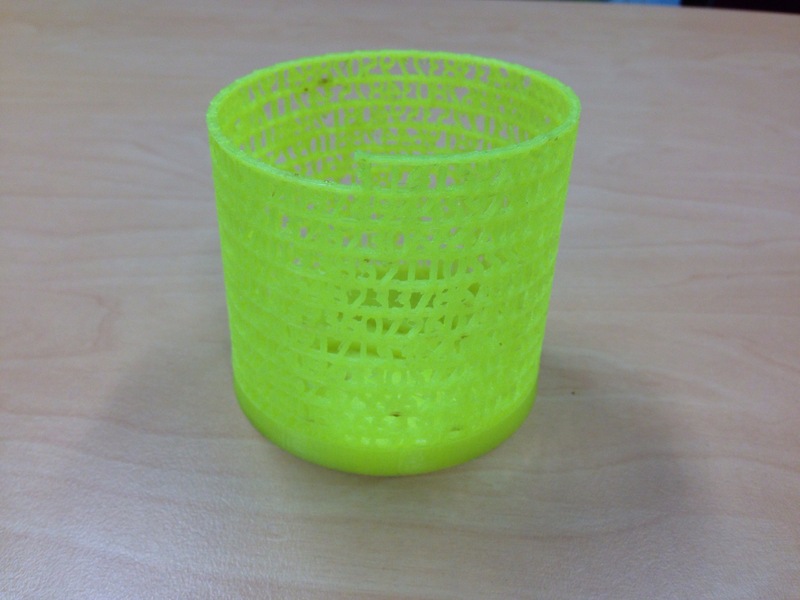 Instead of being a liquid dye, or an ultra-fine powder, a 3D printer has a roll of solid plastic. This is melted and deposited in layers on the printer bed, slowly building up the object layer by layer, 1/10th of a mm at a time. 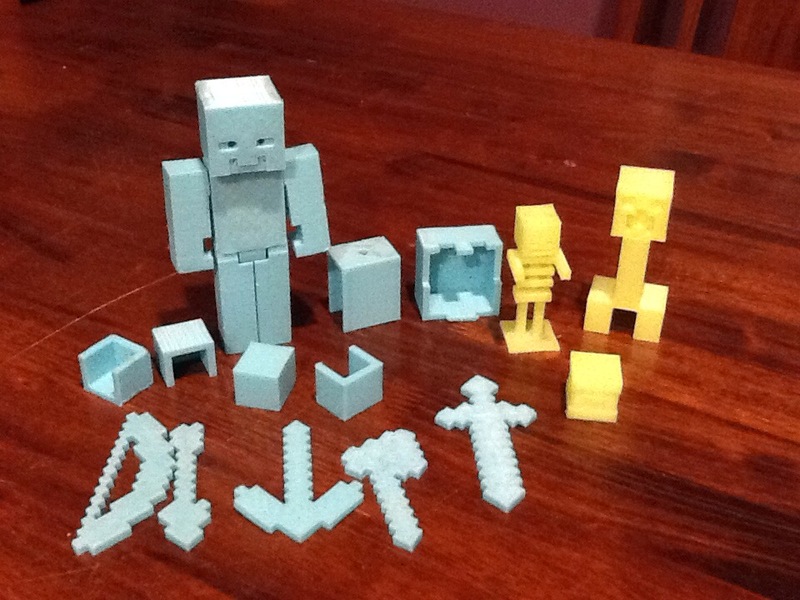 A basic printer can normally handle PLA and ABS thermoplastics (the latter being what Lego is made from), with the right printer components, more demanding plastics can also be used, such as nylon and polycarbonate. 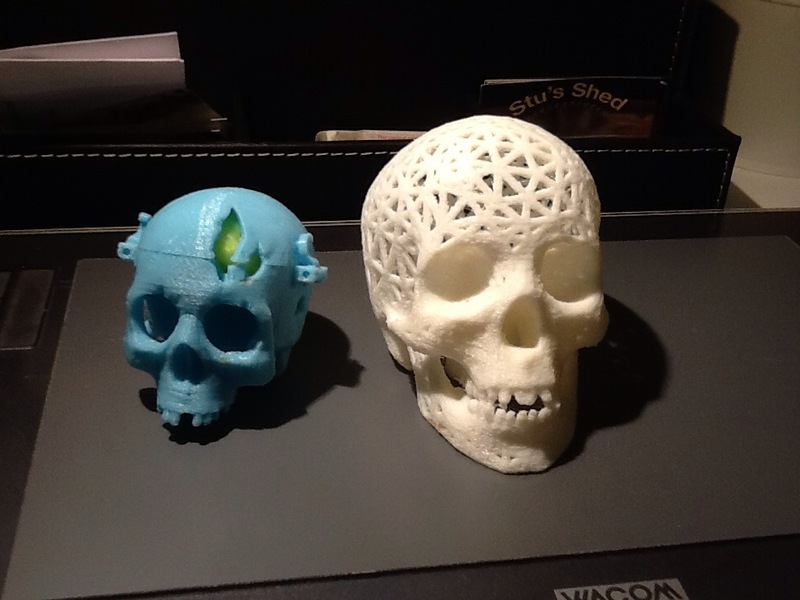 3D printing isn’t just reserved for plastics either. There is a type of wood filament, somewhat akin to printing with MDF that a reasonably basic level machine can print. There are already food printers, able to make creations in extruded sugar or chocolate, and top end (industrial) machines are around that can even print titanium components. Plastic filament comes in a wide variety of colours, and if you want to get more exotic, there are phosphorescent filaments and heat sensitive filaments available that change colour when held or with environmental temperature changes. You are not restricted to printing a component in a single colour either. In addition to some filaments that change colour along their length, a dual head printer can switch back and forth between a couple of colours. If your controller can handle it, there are four head units available, and even one that allows two different coloured filaments to be mixed in the printer head as the filament is extruded. More advanced models can be made, not only by printing support structures, but by printing these support structures with a dissolvable material (polystyrene). While early generation printers used to exclusively use 3mm diameter filament, 1.75mm diameter printers have become the norm. Each material has its advantages and disadvantages, so you choose the material that is most suited to the job at hand. 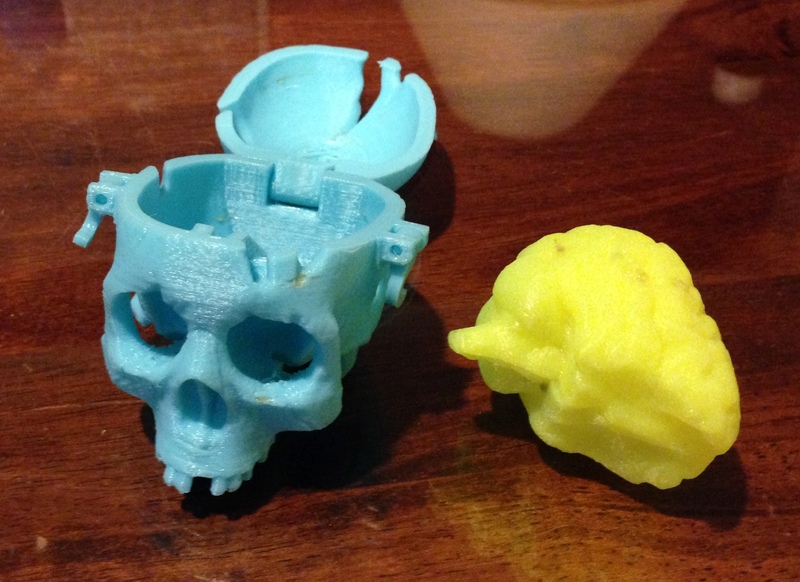 PLA is easy to print with, and is a sugar (rather than an oil) derivative. It melts at a relatively low temperature, with a printing temperature around 195C, and does not need the printer to have a heated bed. In saying that, I do find that heating the bed to 40C helps with bed adhesion. It is stiffer than ABS, and not as strong. A parts fan is ideal while printing, and the filament will absorb moisture and become difficult to print. It can be used as a dissolvable filler when the body of the print is ABS. ABS is also easy to print, although a heated bed is mandatory. Needing a slightly higher print temperature of around 230C, and a heated bed temp of 90C, it doesn’t melt so much as soften and flow sufficiently to be printed. It is more prone to warping during printing, but the stronger, flexible result is often worth the slight increase in hassle. There are a number of ways to get an object ready to be printed. The easiest (and by far the most common) is to have someone else do the work! What is nice about the 3D printing community, is its willingness to care and share with each other. Not only are there plenty of people on forums ready and willing to help troubleshoot any issue you may have, there is a massive library of three dimensional objects that people have created and are then shared for free. 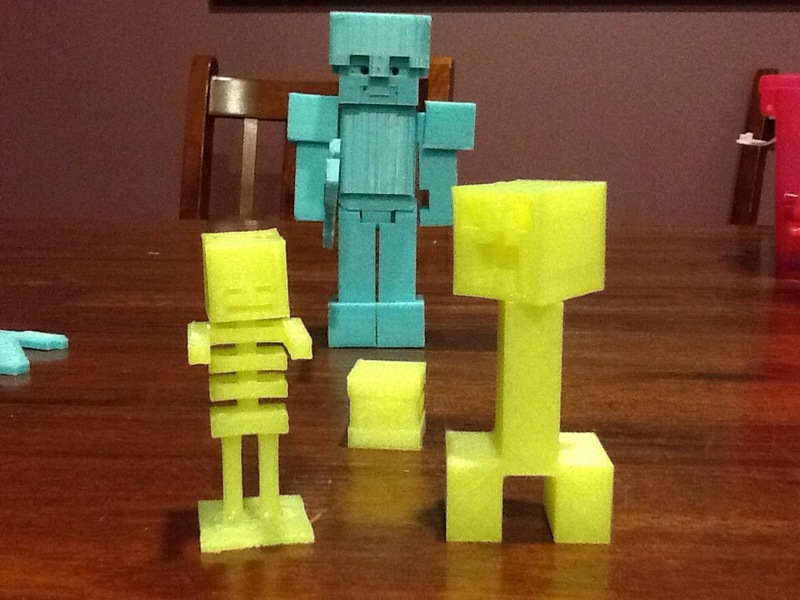 A very popular source of these files is a website called Thingiverse (www.thingiverse.com). Here you can find thousands of objects, ready to download and send straight to your printer. 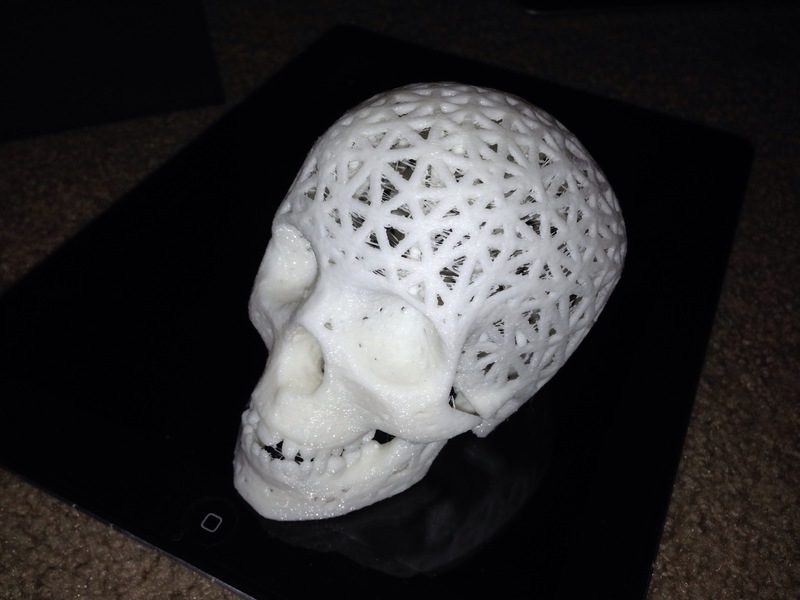 The file type normally used for 3D printing is .STL, otherwise known as STereoLithography. 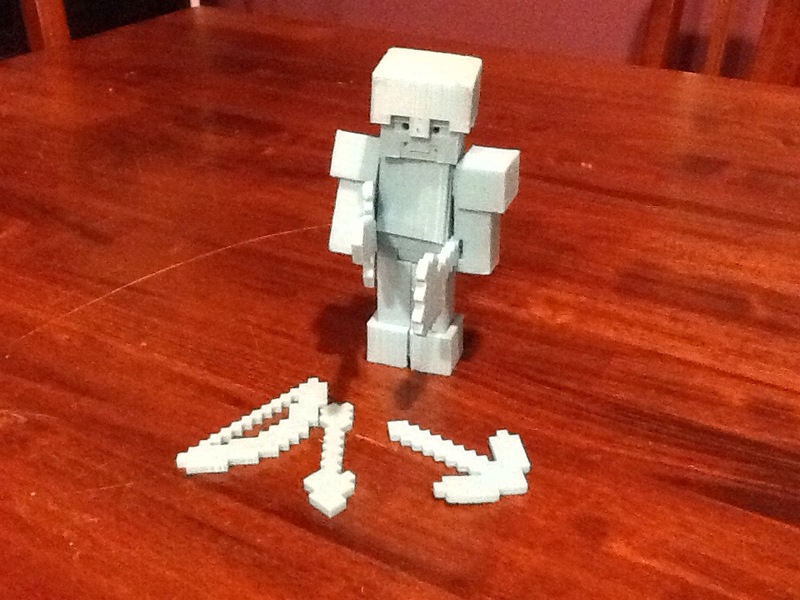 For the more creative, there are a number of 3D programs available to create objects from scratch. These include Photoshop (the latest edition supports 3D printing), AutoCad, 3D Studio Max and a host of others. Even Google Sketchup can be used, if an STL plugin is installed. The last method is to mimic reality. 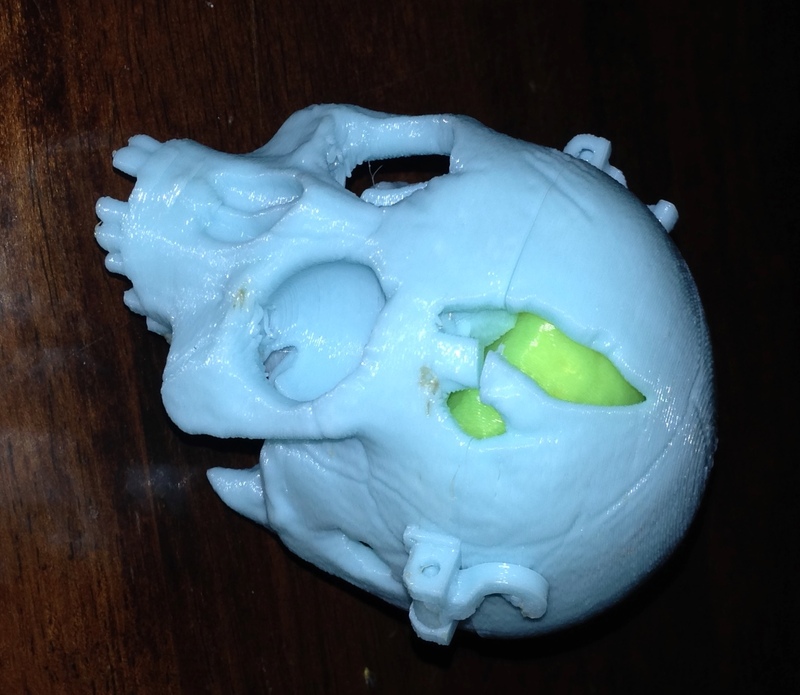 With the right tools, an existing object can be scanned into the computer in 3D, manipulated, then printed. 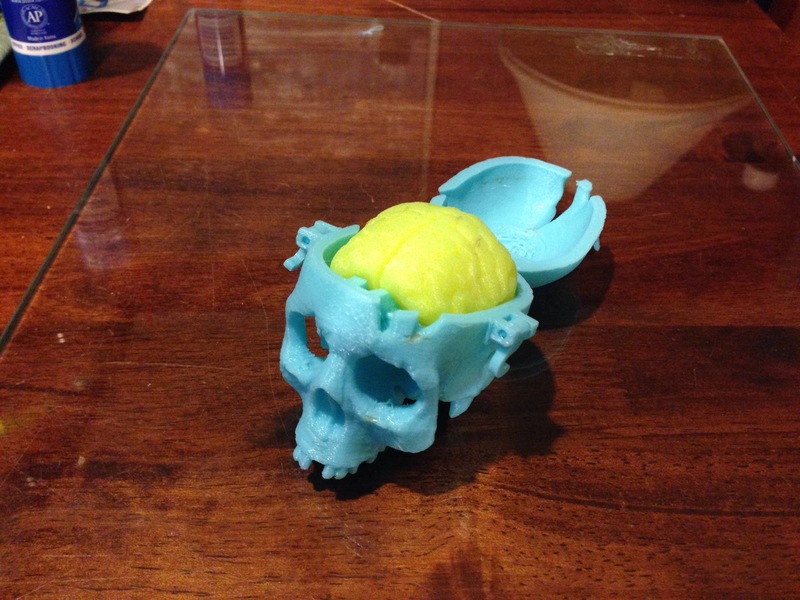 Once you have a computer-based 3D object, the next step is to prepare it for printing. This is done using a slicing program, which works just as it sounds. It takes the object you have provided, and slices it into individual layers, including working out all the tool paths required to achieve it. Given each layer can be around 0.1mm high, it is rather handy that the computer can automatically handle this step! The slicing program takes the parameters you have provided (thickness of outer wall, percentage of infill, printer head and hot bed temps, operating speed etc etc), and produces the G Code that gets sent to the printer controller. There are a number of free slicing programs available, and some costing between about $50 and $150. Programs include Cura, Sli3er, KISSlicer, Simplify3D and Repetier-Host among others. They have different advantages, and some support multiple head printing, and multi-material printing. 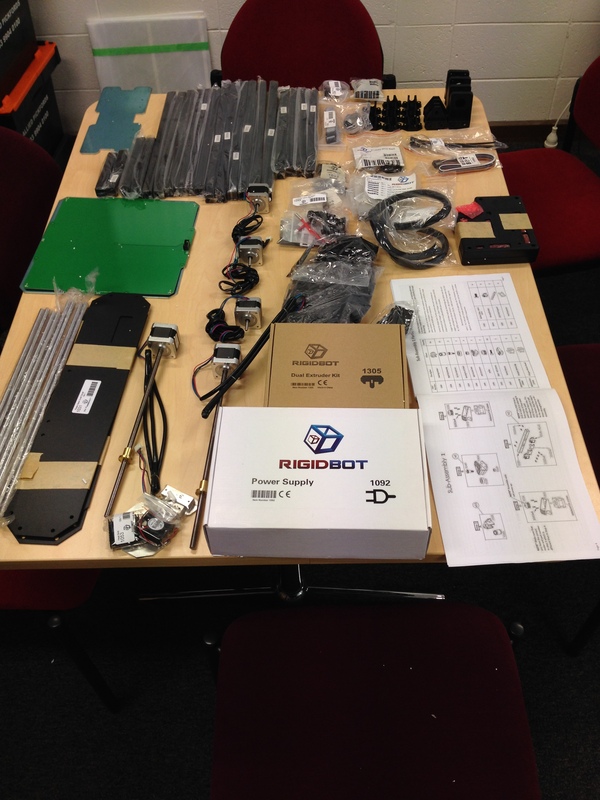 Finally, it is time to turn the computerised object into something tangible. 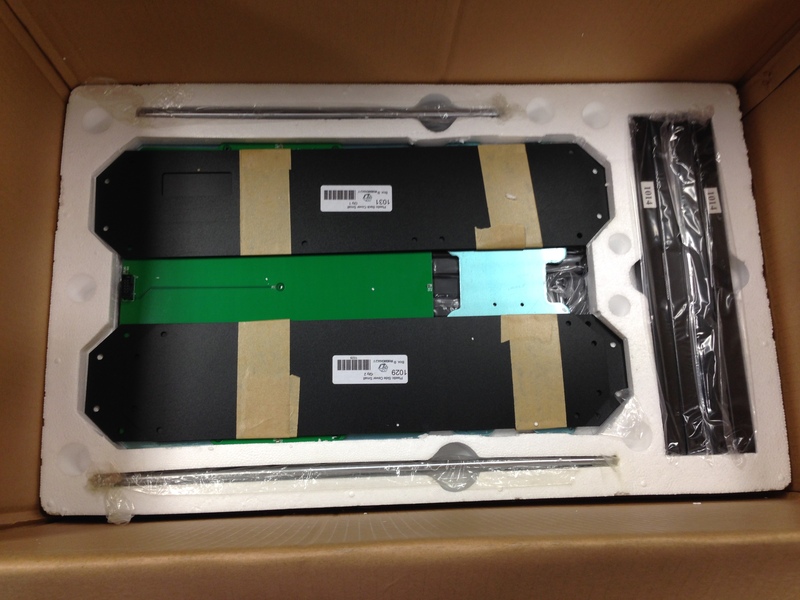 The required filament is fed into the print head, and the print bed prepared to ensure print adhesion. Having a print separate from the print bed is one of the most common failures. Kapton tape, blue painters tape and hairspray are all techniques that are utilised. I find using a glass bed and a gluestick quite effective, but am still experimenting to find my preferred option. It is important that the printer bed is level relative to the print head, particularly so the first layer is laid down properly. Too much gap, and that portion of the print will not adhere to the bed, too little, and the print head can be blocked and under-extrude (or worse, back up in the print head). If a particular design has a low surface area on the bed, the slicing program can have other options enabled, including printing a ‘raft’ that the print is then attached to which is easy to remove at the end. 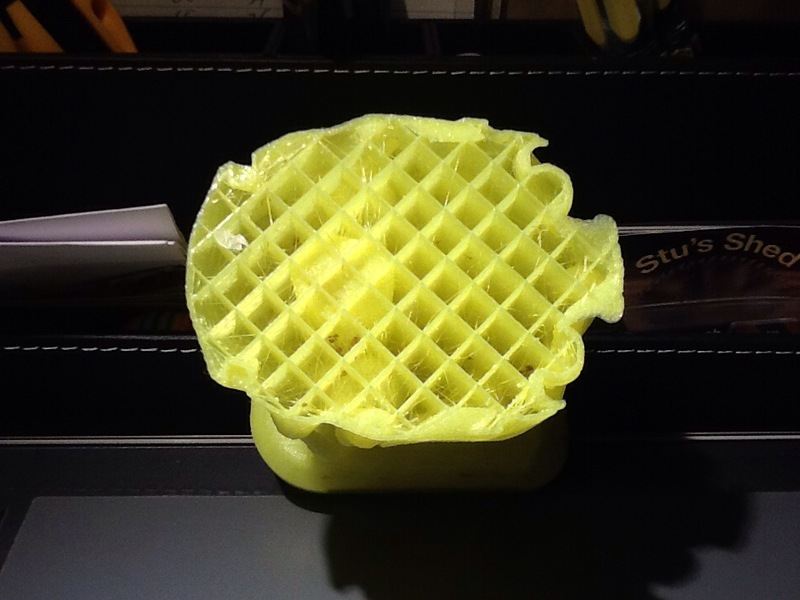 As the print is molten plastic, it needs to be supported until it hardens. While that happens very quickly, only so much overhang or unsupported area is possible. A print fan that rapidly cools the resulting print helps, but the main way to span large areas is to print supports. These are cut away once the print is finished. Some designs come with supports built in, otherwise supports can be turned on in the slicing program, which will calculate the supports required for a successful print. Printing on these small-scale printers is not exactly the fastest process. 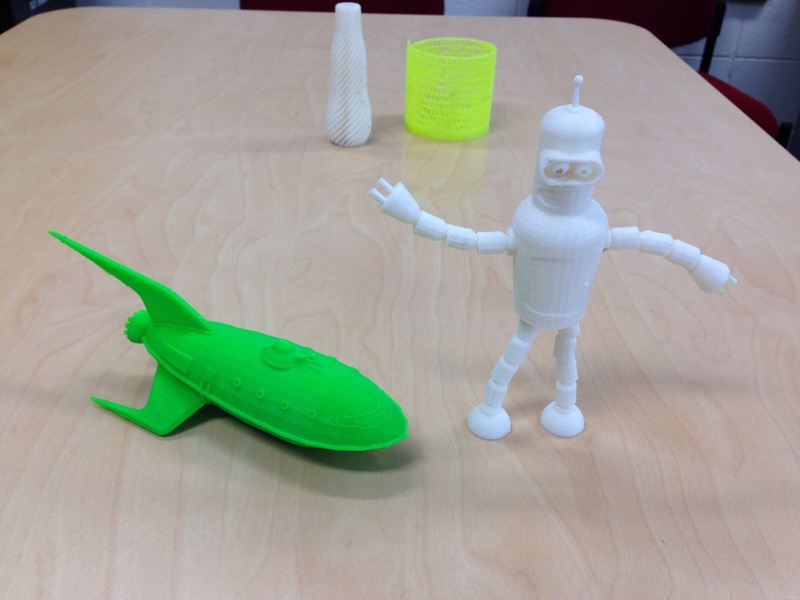 The “Planet Express Ship” used 22 metres (65 grams) of filament, and took 3 ½ hours. 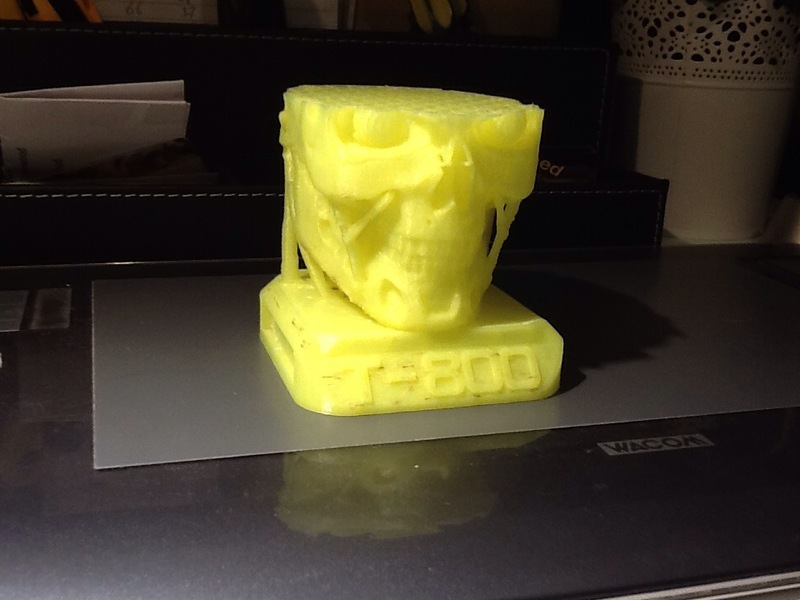 A Terminator model head, 130mm X 110mm X 175mm takes 95 metres (284g) of filament, and takes 18 hours to print. An object the size of a GoPro case (specifically “The Frame”), uses 13 grams of filament, and takes 45 minutes to print. The Frame retails for $65, and takes 23 cents of filament to print. An iPhone case retails for about $35. A printed case takes about 45 minutes, and 18 cents of filament. Gives you pause doesn’t it! It is pretty common to take the finish of the part straight from the printer, so much work goes into refining the setup and settings to maximise this quality. There are as many variables that can be tweaked as components in the printer, and settings in the firmware. While printers will come reasonably well setup, I have also seen when someone with a gift sets up the same machine, and gets their prints to sing with the quality of the result. There are other finishing steps that are possible, from using a high speed grinder to clean up prints, sandpaper, through to acrylic paint, and, for parts printed with ABS, acetone smoothing is available to achieve a high gloss, smooth result. Parts assembly (or repair) where required can be achieved by a number of methods as well, from using glue, to friction welding, again using the high speed rotary tool to hold and spin a short length of filament (5-10mm). When touched against the object, the friction causes the printed plastic, and the spun filament to melt together as a plastic welding technique. 3D printing has been a long time coming, from the first 3D print in 1982, and the first 3D printer in 1984. Like a classic example of exponential growth initially slow over an extended period, when it gets sufficient momentum the explosive growth is near impossible to comprehend. That is where 3D printing and the whole additive manufacturing process is rapidly heading. We are seeing the start of the final growth phase now. 3D printing of houses, body parts, Formula 1 car parts, the first parts printed in space, and soon military supply lines and disaster relief operations are likely to be supplemented with the same. At home, it is still very new, but it will not take long at all to become part of the landscape. It is making its way into schools and universities, and while it may be too late to wrest large scale production back to this country, boutique manufacturing and prototyping, and manufacturing on demand is a fascinating opportunity. It is a great time to get involved, and start to become familiar with the technology…..and its idiosyncrasies. In a decade, the machines we are printing with now will look like the Wright Brothers plane compared to the latest A380, and although it will be very interesting to see how the printers change over the next decade, it is even more interesting to be involved in some small way in the development process. 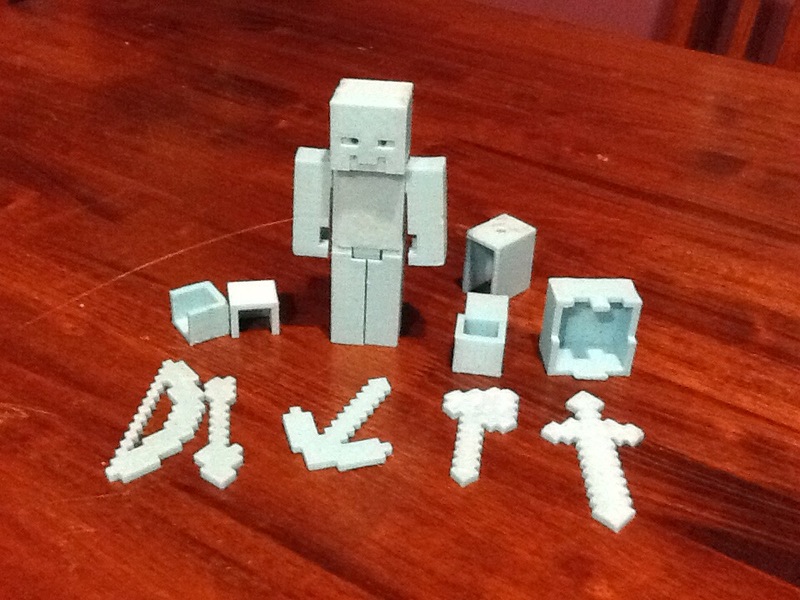 Been concentrating quite a bit recently on the 3D printer. It is a really interesting learning curve, although it has its fair share of frustrations! So long as you are able to work out what goes wrong when it does, so you can learn and improve (technique, settings, components etc) then it is a valuable experience. The technology (at least the very low cost machines) is still pretty rudamentary, and needs constant massaging to get results. In saying that, successful prints are rewarding- fascinating to watch the process, and what is produceable is quite amazing. Not sure how my ratio of success to failure is going – I’d probably be lucky for it to be 1:1, but as I refine things, that will continue to improve. The first major problem I had to deal with was bed adhesion (and that can still rear its ugly head!) If the print dislodges from the bed, then it gets pushed around by the printer head, attaches (and melts) to the printer head, or at the very least is no longer where the printer things it should be, so the printer tries unsuccessfully to print in mid air. Great if you wanted a birds nest! The birds nest, and the dog turd. Neither were what I was aiming for. I’ve pretty much resolved the bed adhesion (mostly). The original aluminium bed is now gone, and in its place is very flat, thick tempered glass (actually some Ikea glass shelves). 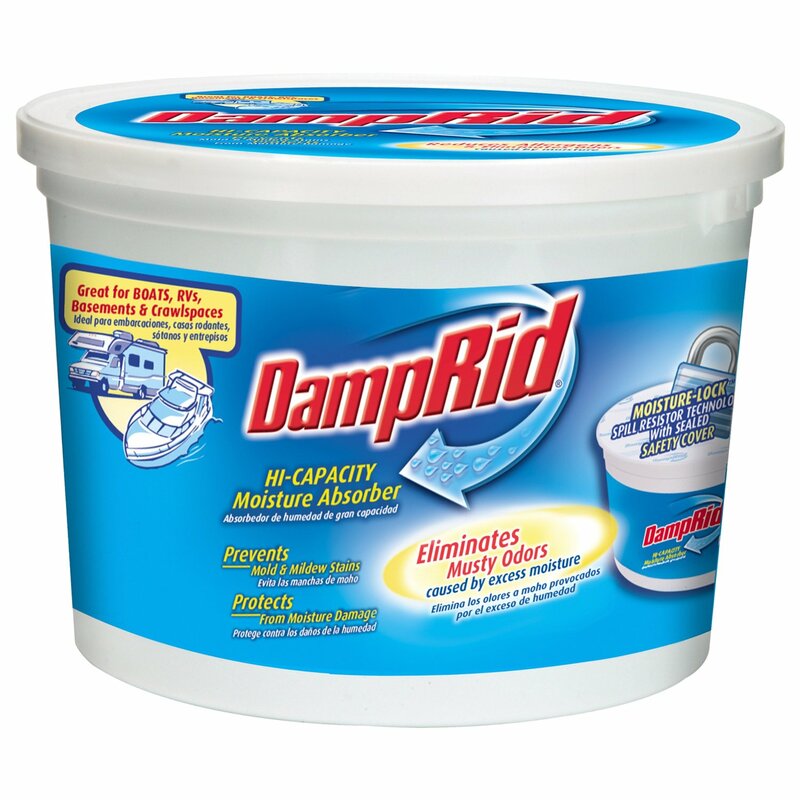 A regular wipe with a gluestick is sufficient for really good bed adhesion. 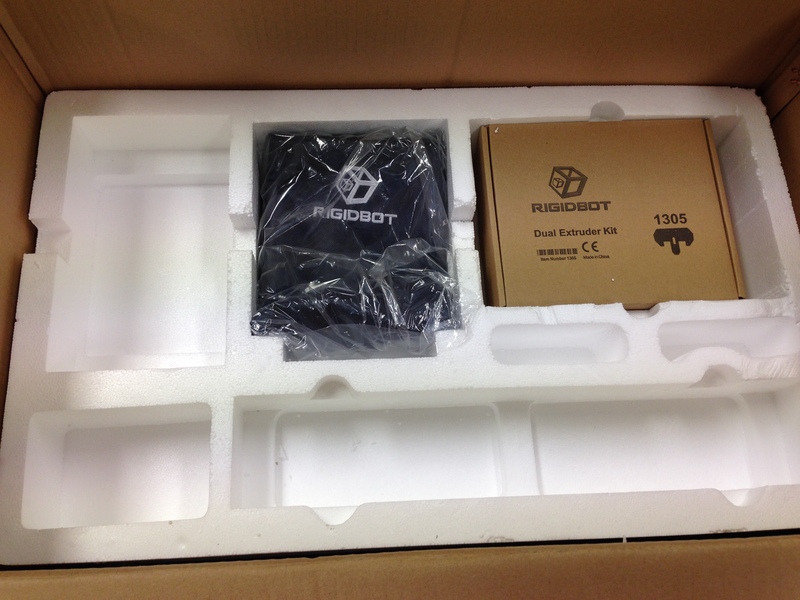 Why I bought the Rigidbot (RB) kit, and not a preassembled model? So I knew how it was built, and can disassemble, fix and rebuild easily, knowing how it all goes together. 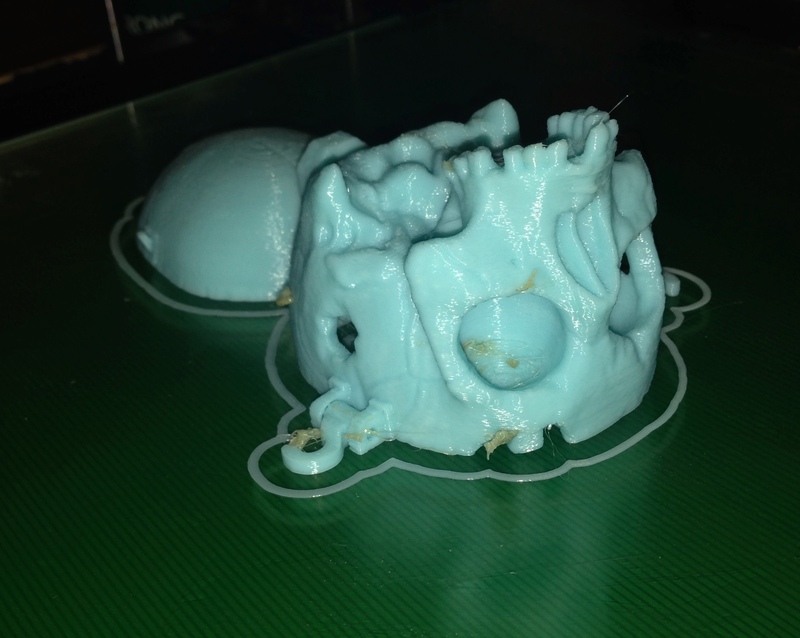 Printing was going pretty well, but over time it was becoming increasingly obvious that there was a leak in the filament path, allowing molten filament to escape, run over the outside of the nozzle and drip into the print. Next, I was starting to get significant shifts during the print, which is obviously not ignorable. 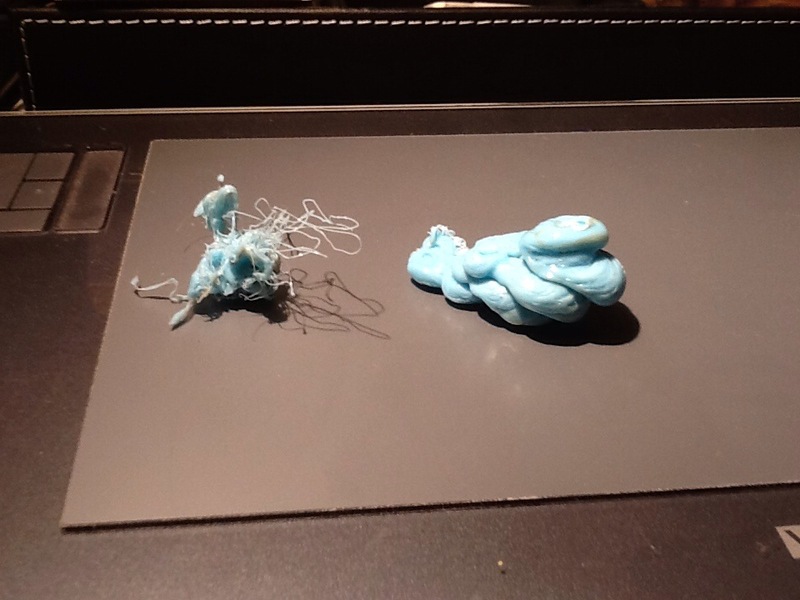 It got to the point that the printer jammed during the print, I’m guessing on a significant glob of plastic. Not sure what caused the shifts, but one problem at a time, and maybe the second would resolve itself. I have a dual head, so went to upgrade the second nozzle to the correct hotend (got two types in the box, and installed the wrong ones, thus the leaks that were developing I assume). 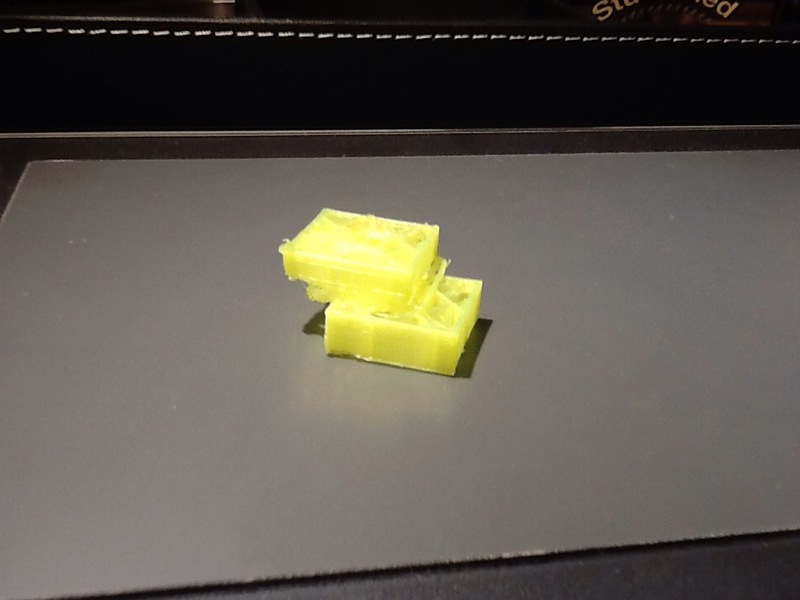 Managed that, but then the printer would not work- gave an error about a extruder not being available. Turns out that even though I was careful, and it looked fine, the thermister was dead anyway. At the same time on the working head, one of the wires pulled out from the connector for the heater. There was so much solidified plastic ooze, nothing could be unscrewed- not the thermister, not the heater, nozzle, even the retaining bolt. Tested again, but this time shorting out the two pins. Same error, but this time max temp. Ok, pretty sure the problem is the thermister. Reflashed the RB to make it a single extruder unit. That way I could fire it up enough to bring the heater online. Turned off the RB, and while still hot, undid the thermister fully. Rebuilt the RB head to a single head setup using each of the still functional parts. Fired it up, tested, and we are back and working. So much easier having built the unit from a kit, this was a relatively easy evolution. Lots of other lessons learned, such as what happens when the filament tangles on the reel 8 hours into a 10 hour print. Interesting though, it does show the internal fill structure that the slicer program creates. This is currently set at 10%. However, despite the myriad of failure mechanisms, there are also many successes. A lot at this stage is printing for printing’s sake, as each one provides valuable lessons. Once that is nailed down, project design and 3D modeling will be next, as well as post printing treatment- smoothing prints with vapour baths. Don’t worry, it won’t dominate the woodworking, but anything interesting, challenging and stimulating is going to get my attention! In the long run, it will be able to complement other shed operations. First quick video of the printer working. 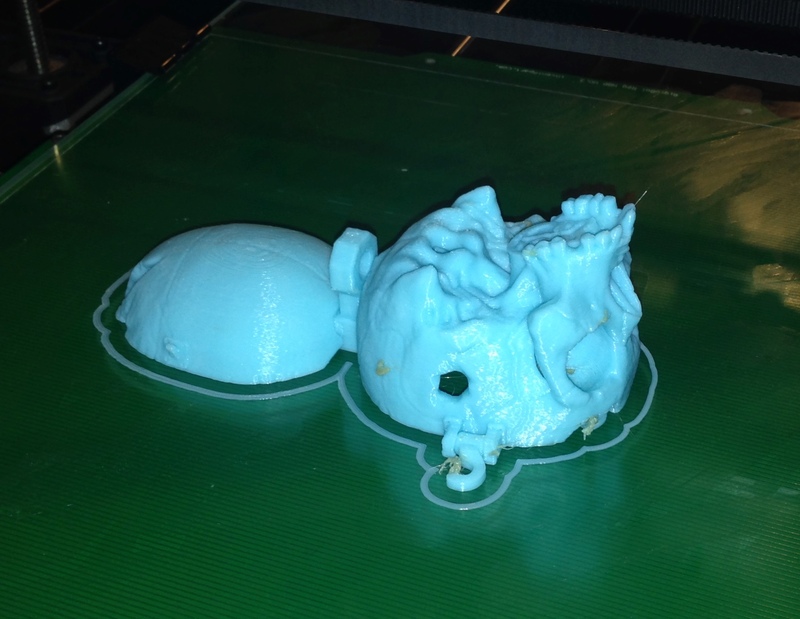 Had a few teething problems, mainly around getting the print to adhere to the bed. Removed the aluminium bed and replaced with glass. A quick wipe of the surface with a glue stick, and we were away laughing! Hooks to hold the lid closed. The rear hanging point has since been removed (bandsawn and sanded). 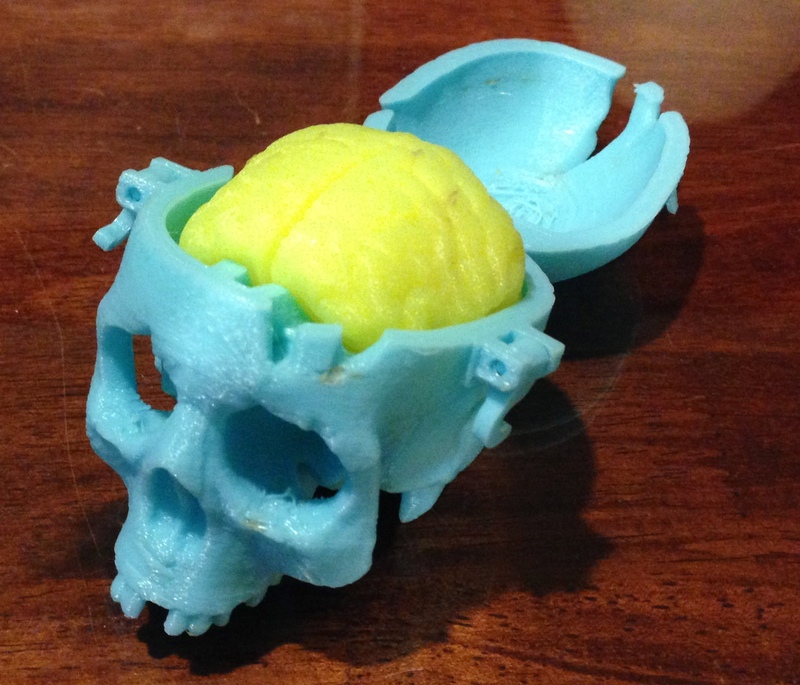 Yes, the 3D printer is working, and has actually managed to print its first object. But more on that in a bit. First, a bit more of a look at the printer itself. 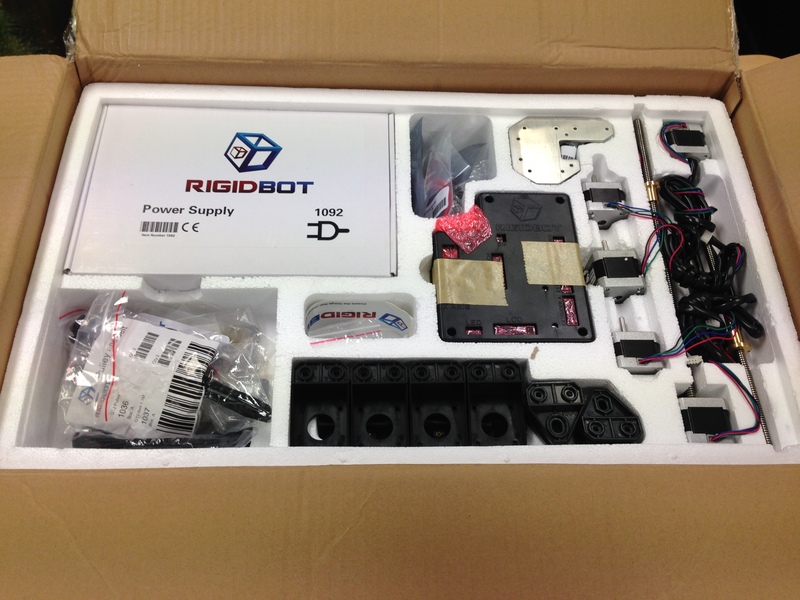 The printer is a RigidBot, and was purchased through a Kickstarter project. It took a lot longer to arrive than was originally anticipated, and there was certainly some angst on the way. However, it finally arrived, and wasn’t too hard to assemble (despite the instruction manual). There is a Google+ community which are very supportive, and a great source of advise on the machine, and printing in general. 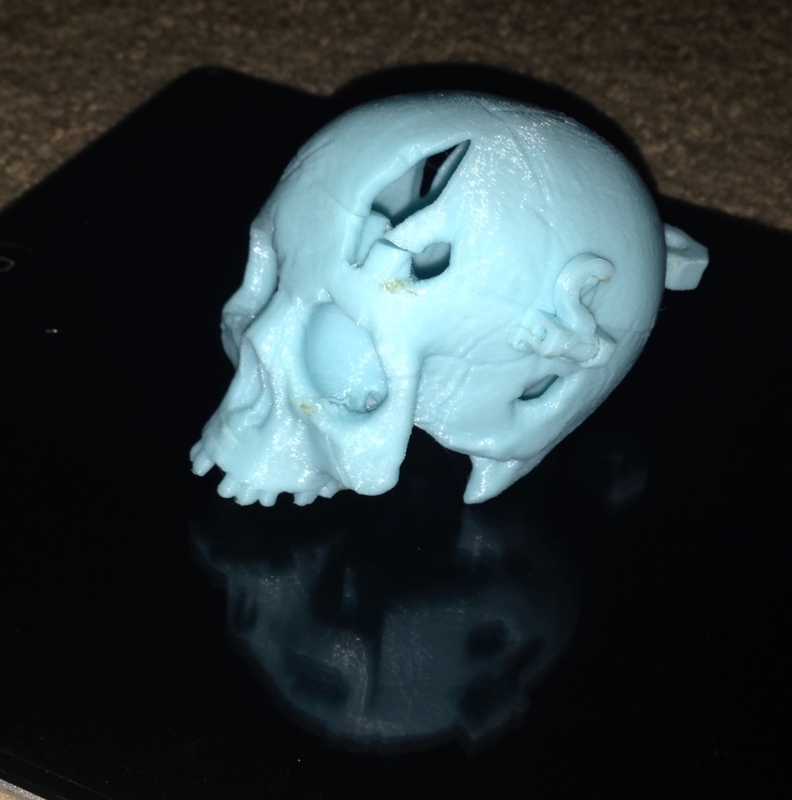 The printer has a 10″x10″x10″ build area, so can make some pretty significant objects. It could be scaled up if I ever wanted to (not that I am likely to). It has a dual extruder which allows it to print two colours simultaneously (or two different materials) It is primarily designed to print PLA and ABS plastics with the extruders that it came with. These may get upgraded at some stage, depending on how well it behaves! Bit of a view of the printer head, otherwise (and more commonly known as) the extruder. It consists of a stepper motor that draws the plastic in and down into a PTFE tube that leads to the nozzle. 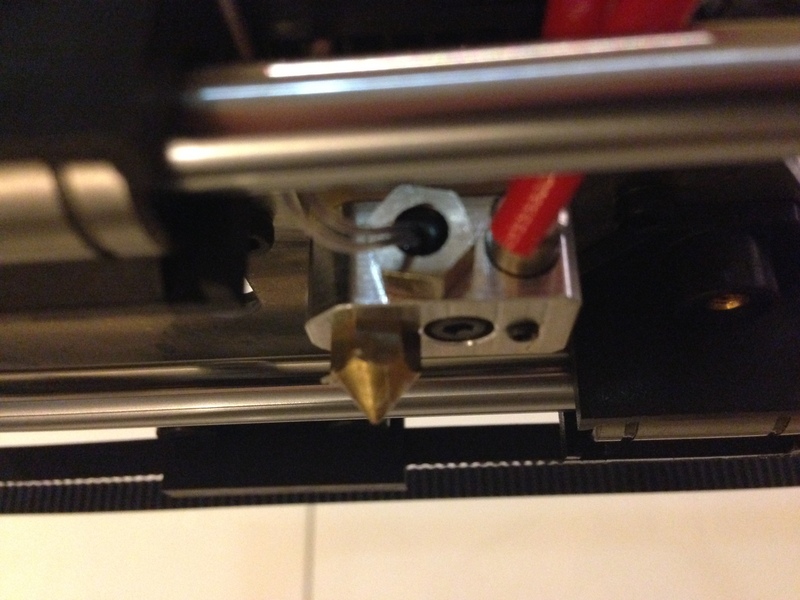 The nozzle is heated to around 200C (depending on the specific material – 195C-210C or so for PLA, and around 230C for ABS). That is heated by an element – these are at the end of the red leads in the image above. There is also a thermocouple attached to the same block, to accurately control the temp. This the X and Z axis motors – the Z axis has the threaded rod. 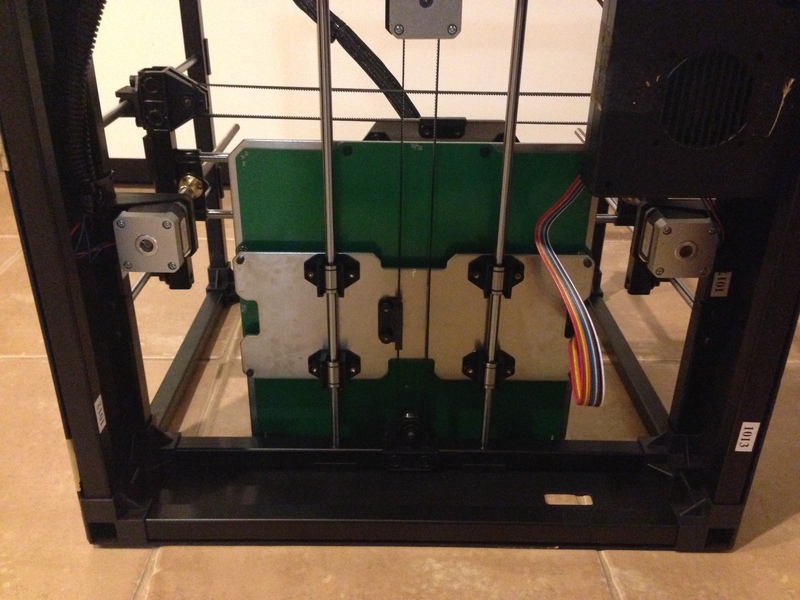 The X axis is controlled with a belt attached to the print head. On the right hand rod, you can see one of the limit switches, which is used by the control software to zero the location of the head. The Z axis has two motors working in tandem – this has its good points and its bad points (when one jambs!). I have taken to using a dry machine lubricant (with PTFE) on the shafts and threads, which has made a lot of difference. 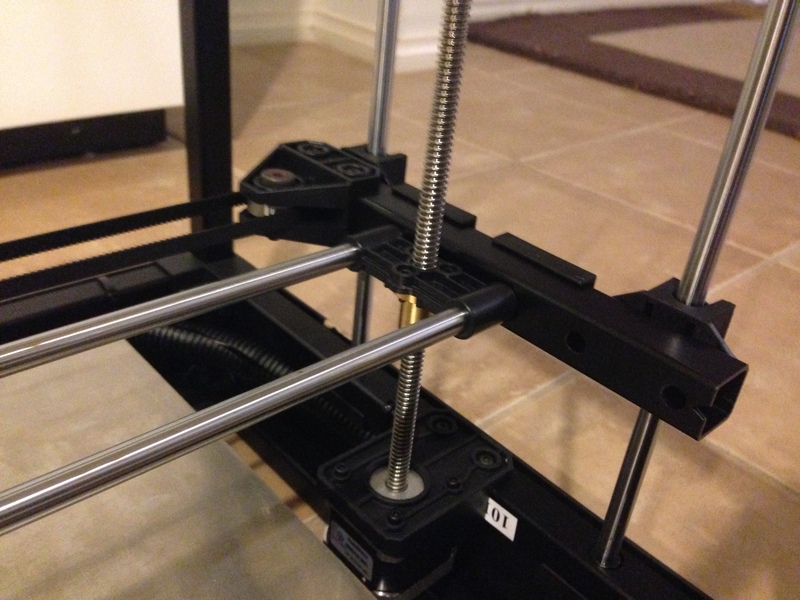 The extruder head only moves along the X axis (and the rails it is on are raised and lowered by the Z axis). To get the Y axis, the platform that the print is made on also moves (this view is from underneath). The green board is the heater element, allowing the base to be heated to 40-110C or so to aid adherence, and prevent warpage (especially of ABS). 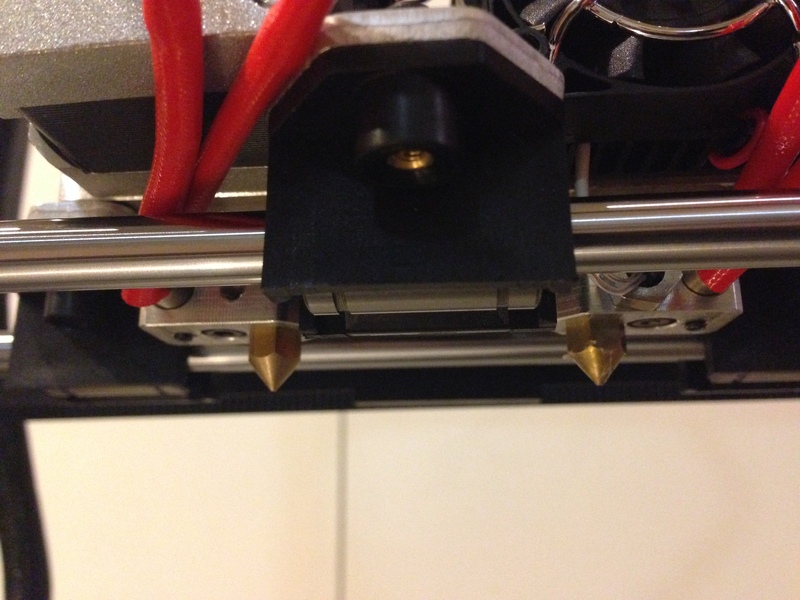 View underneath the extruder, showing the two 0.4mm nozzles. Another view of one of the nozzles, the heating element (with red wires), and the thermocouple (wires passing into the hex connector). 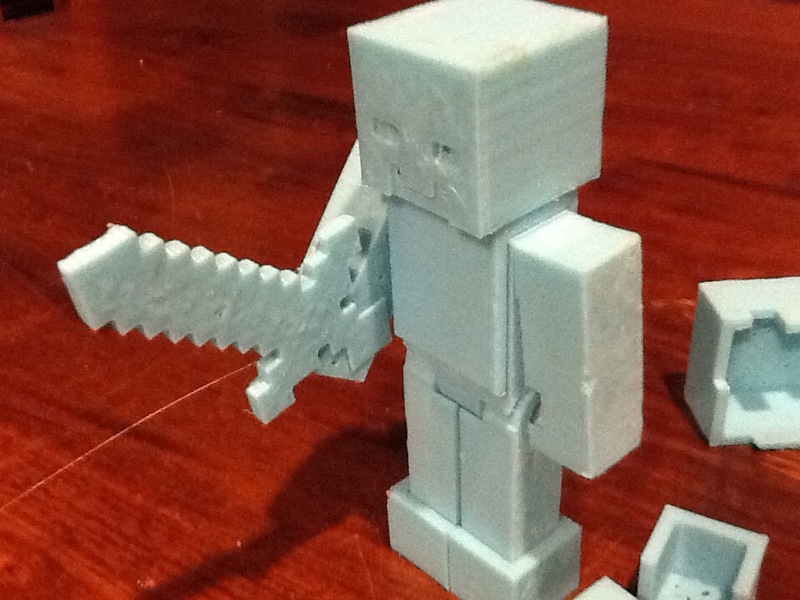 The first print run went well for a time – a little robot figure, but it didn’t have a head! Took a while to work out why (and with advice from a forum member). Turned out the default temperature setting in Cura (a slicing/printing program) was too high, so the filament melted before it should have, causing a blockage. The next attempt worked well, printing at 60mm/s, 195C with 0.2mm per layer. I haven’t been able to repeat the result, as the next few prints detached from the bed partway through the print. The recommended blue tape is not working in this case, even when I tried another suggestion which involved hair spray, so I’ve ordered something more appropriate for the task – some polyamide tape, and some vinyl bed tape – either should make a lot of difference. A few initial teething problems, but we’ll get through those. I’m sure there will never be a time when the system is perfectly reliable – it will always need some tweaks and mods. At least it is an interesting learning curve! 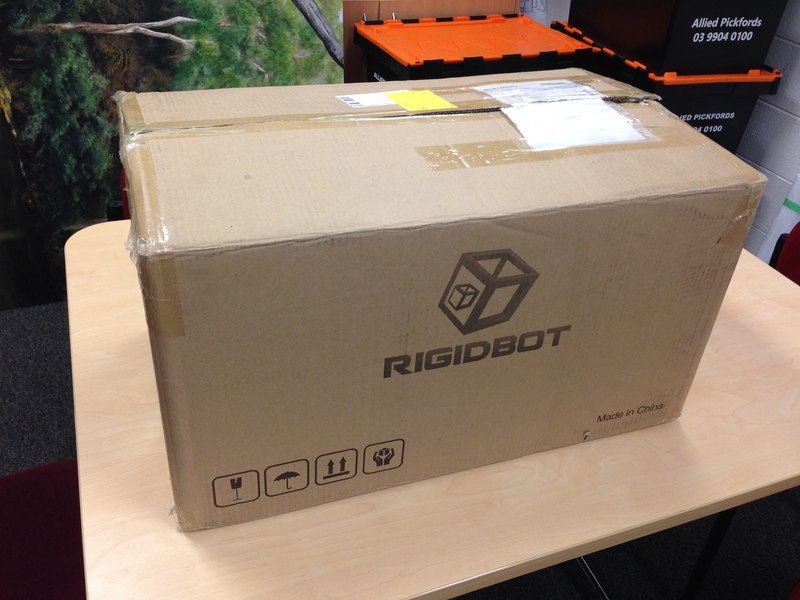 Yes, this means that after a very long wait (18 months from order to delivery), the 3D printer ordered through crowdfunding (Kickstarter) has finally arrived. 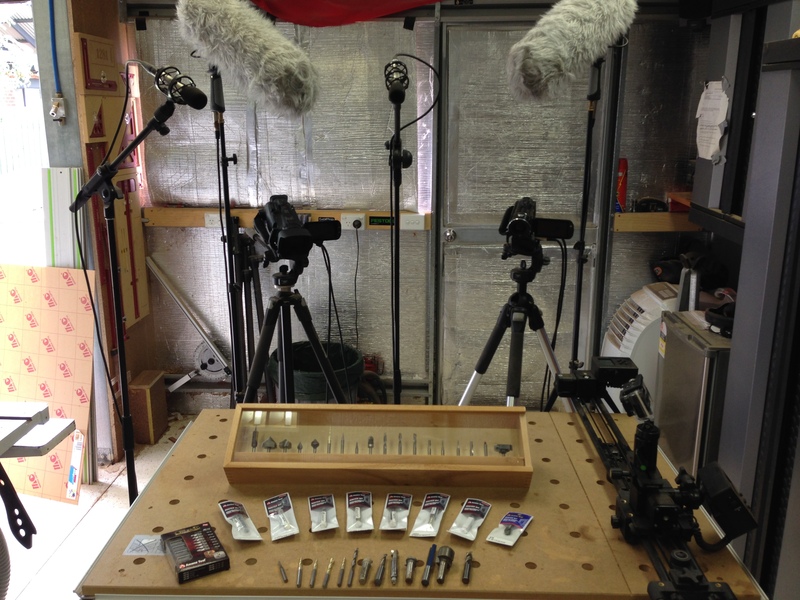 Next, the items were removed and laid out, ready for assembly. And then assembly begins. Taken in short bites (as time permits), it will be a few days before testing can begin. Extrusion nozzle, with heater and thermister. Coming together pretty easily (despite the instruction manual!). 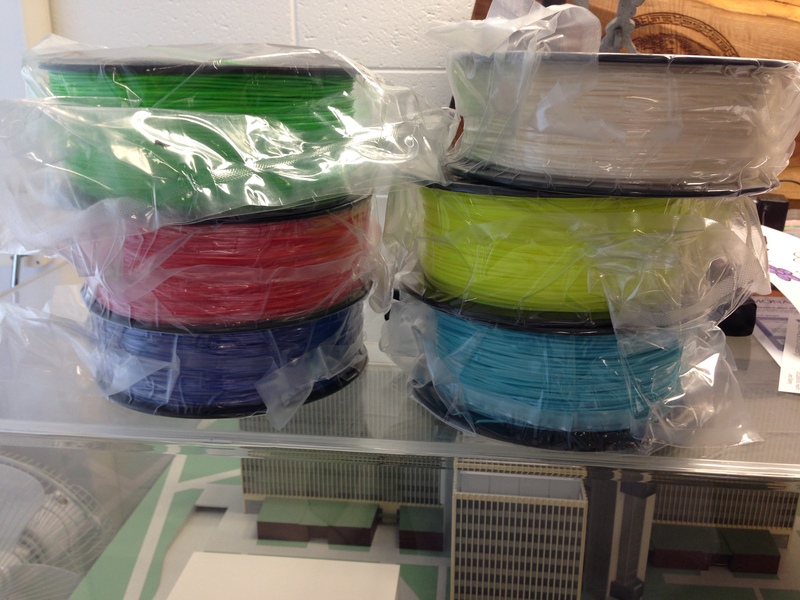 And finally, the rolls of filament (both ABS and PLA) ready to be turned into something else.